Winter arrives and it looks set to be a harsh one. Toad comes to see Fox, Vixen and Owl to say goodbye before his hibernation. 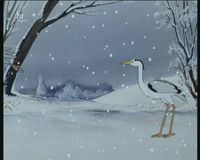 As heavy snow falls, the animals find it harder to find food. Whistler and Speedy find a supply of crayfish in the stream, and share it with the other meat eaters. You’ve saved our lives, Whistler, declares Vixen. Soon the Foxes are hungry again and decide to try and hunt closer to Scarfaces’s territory. Scarface and Lady Blue watch them go past. Vixen is angry. It’s as though they are keeping us prisoner . She heads to confront the blue foxes, but is threatened by Scarface. 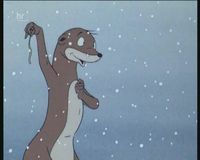 Weasel finds some nuts, and offers them to the squirrels in exchange for a warm bed for the night. When the squirrels discover Weasel stole them from their larder in the first place, they throw her out of the tree. Meanwhile, Badger is restless and leaves his set to see how the others are doing. 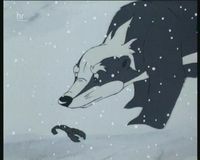 He crosses a bridge made from a fallen tree trunk, but it collapses and Badger lies injured and unconscious in the snow. 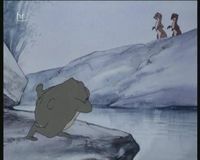 Mole is extremely worried when Badger does not return to his set and rushes to inform Fox who organises a search party. While out looking, Fox meets the White Stag, who offers some hay to feed the smaller animals. Badger is found by the park warden and taken to the warden’s lodge. When Badger wakes up, he makes friends with the warden’s cat. Badger is worried about his friends, and manages to persuade the reluctant cat to take a message to the Farthing animals. The cat heads out into the park and finds Mole, who is delighted to hear that Badger is safe. The cat is leaving to return home, when Mole calls to him to come back. As the cat runs back, Kestrel spots him from the air and thinks he is about to attack Mole. Kestrel attacks the cat, digging her talons into his back. As Kestel realises her mistake, Vixen arrives. The cat collapses in the snow with deep cuts on his back.